The Dollar-Yen pair staged a solid rebound from the 10-DMA on Tuesday on the back of a hawkish Yellen and more 'Kim fatigue'. The spot rose to 112.48 yesterday and extended gains to a high of 112.55 levels in the Asian session today. 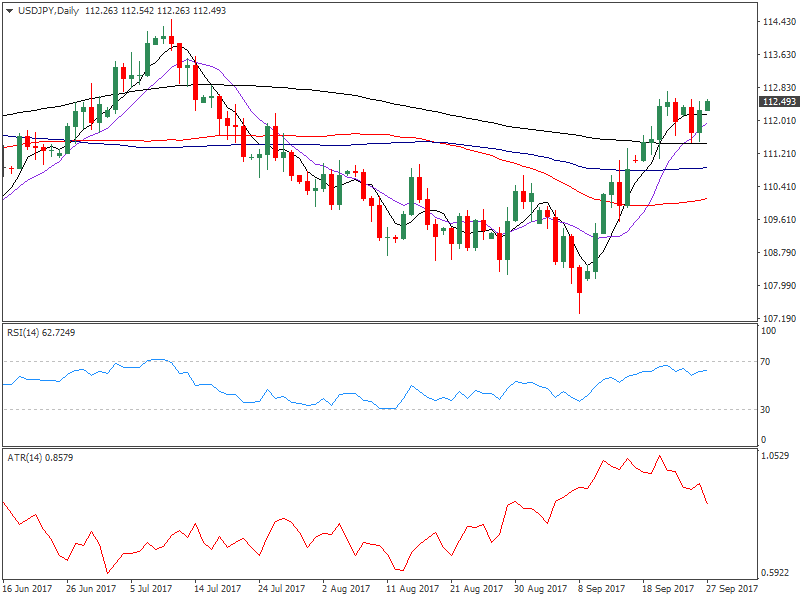 Despite being bid above the 200-DMA, the currency pair is having a tough time, extending gains beyond the 112.50 levels. At press time, the spot is trading at 112.37 levels. The exhaustion could be attributed to technical factors rather than macro/fundamental ones, which favor of a rally to 125.00 levels in the medium-term. The sliding 14-day Average True Range [ATR] suggests declining interest in the uptrend. Thus, short-term consolidation is likely in the range of 113.00 - 111.50. The 14-day RSI remains bullish, the 10-DMA is sloping upwards. Thus, dips to 111.50 could be met with fresh bids. The range is more likely to be breached on the higher side, given the dollar revival on the back of hawkish Fed. However, there seems to be a consensus in the market that North Korea understands the downside of war and is unlikely to strike the US. "The most likely scenario for the US/North Korea relations remains an uneasy status quo", says Natixis Research Team. No wonder, the markets are developing "Kim Fatigue", i.e. the risk-off on rhetoric quickly runs out of steam. Also worth noting, Japan could suffer collateral damage if the US/North Korea go to war. Thus, the Japanese May lose its safe-haven appeal.